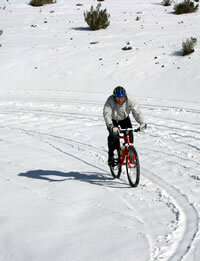 From the earth’s core this mountain is the highest in the world and biking it downhill is an unequalled experience. From Riobamba we drive in a 4WD vehicle to Carrel Brothers mountain refuge at 4800 mts. of altitude. 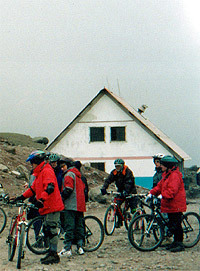 From here, if well acclimatized and weather conditions permit, you have the option of trekking up to 5450 m. Biking starts at 4800 mts. Our return route, not commonly used by visitors, lets us see closely the “front,” most impressive, widest and famous “face” of Chimborazo. On our way down we can spot vicuñas and other fauna in their natural habitat, observe the impressive La Chorrera canyon, ride through alternative backroads and have at our feet amazing views of Colta lake, the Riobamba valley and great mountain ranges capped with six snowpeaks. Biking ends either in San Juan, Calpi or wherever you want. This is our most requested tour. Indigenous communities: Sta. Teresita del Guabug, Pulinguí San Pablo, Tambohuasha, etc. Level of difficulty: Intermediate to advanced bikers.